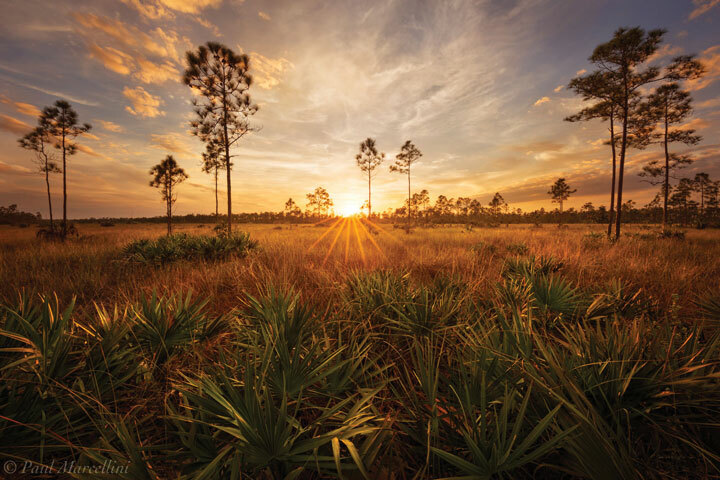 The Everglades National Park article is the third in a series SOMI Magazine is presenting in honor of the 100th Anniversary of the founding of the National Park Service. Our subsequent two issues will further the national parks in south Florida, and seen through the lens of local environmentalist photographer Paul Marcelini. (See somimag.com, Vol. XI, No. 6 for the National Parks cover feature and a profile on the photographer. Everglades National Park spans 1.5 million acres and receives over one million visitors per year. Dedicated in 1947, the large park had a somewhat more modest beginning in 1916 when Royal Palm State Park was named on Paradise Key 15 miles southwest of Homestead. Thanks to the interest of members of the Florida Federation of Women’s Clubs and a donation of land by The Model Land Company (land agent for the Florida East Coast Railroad) and the State of Florida, a portion of the Everglades was preserved at a time when the push was on to drain the land for agriculture and development. In 1929 the Florida legislature provided for the acquisition and conveyance to the Federal government land from Dade, Collier and Monroe Counties for park purposes with Royal Palm Park as the nucleus. 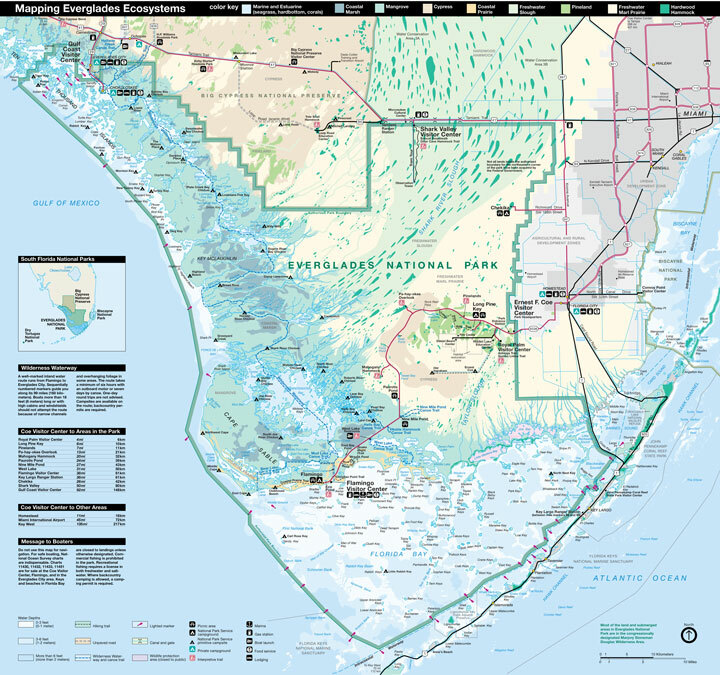 It and the idea of a National Park in the Everglades were accepted by Congress in 1934. Ernest Coe (1866-1951) was a professional landscape architect who came to Miami from Connecticut in 1925. Planning to take advantage of the building boom in Florida, he arrived when the bust began. He spent much of his time exploring the Everglades and became obsessed with the idea of making it a National Park. He established the Everglades Tropical National Park Association in 1928 with David Fairchild, President Bowman Ashe of the University of Miami, Marjory Stoneman Douglas, and others. Coe took two elected officials for a blimp ride over the Everglades in 1930, hoping to impress them with the beauty and importance of the land as a candidate for National Park status. Even though there was interest on the part of the federal government, America was in the grip of the Great Depression, followed by World War II. Coe’s original plan for the park envisioned 2,500 square miles of protected land from Lake Okeechobee to the Florida Keys and included the Big Cypress Swamp. When the park was dedicated on December 6, 1947, it encompassed about one-quarter of the land envisioned by Coe, made up of a patchwork of land parcels. Mineral rights were retained, company lands and private landowners demanded higher prices for their land. Coe was not pleased with the outcome. At that time, only lands south of the Tamiami Trail were within the park boundaries. Despite his extreme disappointment, he attended the dedication, sitting on stage with President Truman and other dignitaries. He was later recognized as the “Father of Everglades National Park” by Congress. In time, more land would be added to the park, including Big Cypress and the waters in the Ten Thousand Islands. There are no other Everglades in the world. They are, they have always been, one of the unique regions of the earth, remote, never wholly known…They are unique also in simplicity, the diversity, the related harmony of the forms of life they enclose. The miracle of the light that pours over the green and brown expanse of saw grass and of water, shining and slow-moving below, the grass and water that is the meaning and the central fact of the Everglades of Florida. It is a river of grass. Ernest Coe’s valiant efforts were not enough to convince the state and federal governments that the park made sense. The real power behind the park’s existence was Spessard Lindsey Holland (1892-1971). Born in Bartow, Florida, Holland became an attorney and served in the state senate, as governor and as US Senator. An old-fashioned southern politician, taking up the cause to set aside land for a national park seemed at odds with his philosophies, yet he was a devoted conservationist. He also saw the park as a tourist draw that he felt would bring prosperity to the state from people wanting to experience the unique qualities of the Everglades. Holland engaged the assistance of the Herald publisher John Knight to take up the cause, as well as the paper’s editor, John Pennekamp. Yet, the future of the land was not entirely secure, and the era of controlling the amount of water flowing to the Everglades was ushered in by the Army Corps of Engineers after the establishment of the park as they sought to tame possible flood waters. The Everglades went from being unmolested by human beings for thousands of years (a coexistence of native Americans and the land), to the nineteenth century vision of draining an unhealthy swamp (Governor Napoleon Bonaparte Broward’s battle cry “to drain that pestilence-ridden swamp”), to one that struck a compromise of sorts–born from the insatiable need to “control” nature. Early maps demonstrate that the Everglades once covered the entire southern third of Florida. Since the establishment of the park in 1947, development and agriculture have grown significantly to threaten the health of the Everglades eco-system and the Biscayne Aquifer. However, recent efforts, such as building a bridge over certain sections of the Tamiami Trail have increased the sheet flow of water and contributed to the health of the Everglades. The visitor center at Shark Valley along US 41 features a 65-foot observation tower. There are hiking trails, tour boat and kayak excursions and ranger-led programs throughout the park. The Everglades is the largest sub-tropical wilderness in the United States. It is recognized as a World Heritage Site and an International Biosphere Reserve by UNESCO, and designated a Wetland of International Importance by the Ramsar Convention on Wetlands. For more information about park programs and amenities, visit nps.gov/ever.